We are delighted to announce a new addition to our collection. The paper written by Leonidas Efthymiou and Sophia Michael (both at Intercollege Larnaca) entitled ‘When Cards and ATM’s are the only choice: A fortnight in Cyprus with no banking system, nor trust’ continues with our aim of informing the debate around cashless society and mobile payments, by detailing the events around the suspension of the banking system in Cyprus. 1) The only bank which offers a Contactless visa card is the Bank of Cyprus. Their 18-25 Youth card is the first card in Cyprus with contact-less technology and can be used for transactions below 20 euros, without having to insert a PIN in front of the POS. For transactions above 20 euros, you can keep the card in front of the POS, but you have to input your pin. 2) There are approximately 1460 enterprises across the island with contactless technology. Some of these enterprises include cafes such as Costa Coffee and Starbucks, pharmacies, bakeries, supermarkets, petrol stations and shops in malls. 3) JCC, the main payment system provider in Cyprus, is currently running a campaign at Nicosia cafes. All contactless transactions that take place at Nicosia cafes are eligible to participate in three monthly draws for 3 IPAD minis. Essential to the 15 day closure of the banking system in March 2013 (similar only to the US in 1933 and Argentina in 2002), was that all electronic transactions and money transfers were frozen with the exception of credit/debit cards and ATM withdrawals. Leonidas and Sophia adopt a ‘sequence of events’ method to discuss an intensification in the use of cash during this period as ‘people can sustain themselves only by queuing at the long lines of ATMs to withdraw cash, or stay cashless and use their credit cards.’ Interestingly, during their research, they were unable to provide evidence to support rumours that ‘IOU’ notes replaced cash and cards as means of payments during Cypriot banking crisis. In summary, the paper of Leonidas and Sophia offers a detail reach account of the Cypriot banking crisis, with a focus on the effects on the retail payment system but without loosing its connection with institutional stakeholders and macroeconomic developments. This narrative is enriched when the authors compare and contrast with developments in the US and Argentina, as it enables to ascertain the unique features of the crisis in Cyprus. In a recent post in the Celent Banking Blog entitled The Mobile RDC Cost-savings Myth, Bob Meara discusses the mirage of costs savings for banking thinking of introducing mobile payments alongside a well developed mulch-channel network. His argument is spot on, the cost of the transaction might be lower but there are also maintenance issues to be considered, activity cost in banking is the stuff of Alice in Wonderland and more important, potential savings might be small when considering that many have already been realized. At the other side of the spectrum, however, are micro-finance institutions working in developing countries such as Mexico. So far many they have relied on staff as the main distribution channel. Mobile payments offer the possibilities of foregoing legacy investments and jumping the queue, sort to speak. Thanks to a travel and subsistence grant from FUNDEF,with Gustavo del Angel and Enrique Cardenas, we have started to map the evolution of payment systems in Mexico. While on site, I was lucky to be invited to a field visit to see first hand operations from Banco Compartamos, a Mexican microfinance institution. The day started early (kicking off at 0630 hrs) to travel in group to the nearby city of Cuernavaca. The sherpa for the day was Enrique Majos, Banco Compartamos CEO, together with his IT and PR directors. We were joined by two other directors at the site. These visits are a regular thing for Compartamos’ directors. I was introduced to all the local staff members and took part in the daily debrief (a pilot scheme in which all team leaders report on their activities for the day and any issues from the previous day). All “colleagues” set off on to meet with their customers groups – along the lines of Gramin, Compartamos lends small amounts to individuals (chiefly self-employed women), who are part of co-sponsor groups. During the meeting individuals bring their weekly repayment and make sure everyone has met their commitment. The “colleague” role is to inquire on the nature and state of the indiviudual’s business while also looking for cross selling opportunities. An “expert colleague” will establish good rapport with all/most the members of the group. If appropriate he/she will also hand deliver a certified cheque for any new loan. Virtually all individuals will bring their weekly repayment in cash. The leader of the meeting will keep track (through a basic ledger and updating individual pass books manually). At the end of the meeting all repayments are then taken to be deposited in a nearby retail bank branch. Hence, Compartamos’ staff do not handle cash. Yet Compartamos has to rely on larger banks and a network of correspondents (such as a chain of convenience stores) to collect deposits and distribute loans. Most of these, in turn, will charge individual depositors onerous fees to provide their service. Like many other microfinance, the distribution channel is challenging growth and diversification. Mobile payments are not the solution at present. For one, the service is highly unreliable outside of big cities and in some of the regions where Compartamos operates, there is no network cover at all. Second and most important, individuals who borrow from Compartamos work in a cash economy. Their business (such as market stalls, beauty products, or seasonal goods) is carried out in cash. Few have access to the Internet or a smart phone (yet all have a mobile). A mobile branch (i.e. on the back of a bus or minivan) could provide some relief provided it is not a target of highjacking or highway robbery. The volume of individual business is not enough to justify deploying ATMs (let alone self-replenishing machines) in the most remote areas while other financial intermediaries discourage their use of ATM through punitive fees. 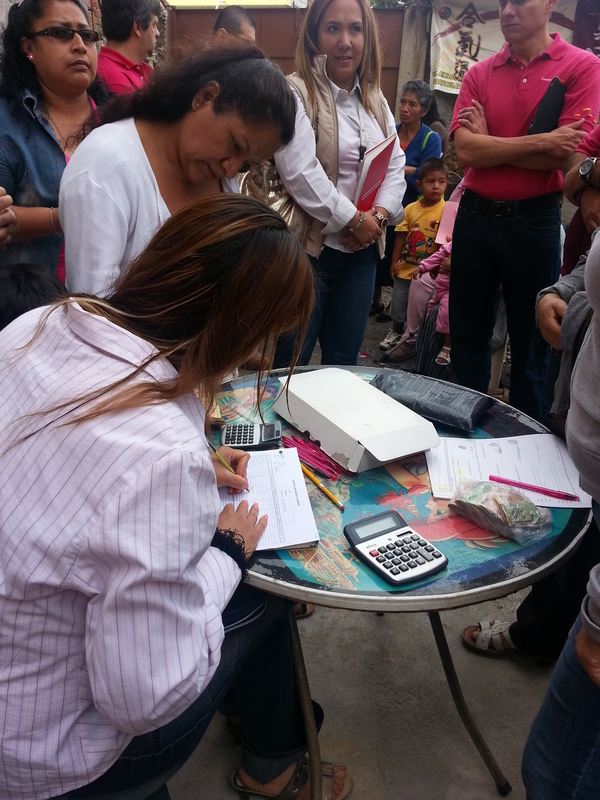 The time is perhaps ripe for Compartamos and other microfinance come together in the deployment. The Privacy Dangers of a Cashless Society Were Clear Over 40 Years Ago. Internet Pioneers Discuss the Future of Money, Books, and Paper in 1972. A recent item in the BBC News website on the Royal Mint (below), found the apparent controversy that where money is actually made (well coins really), employees are not allowed to use them to purchase their food during lunch. This in turn let to a invitation to discuss the pros and cons of the cashless society. This is a superb entry by our friends Robert Kett and Taylor Nelms in the Anthropology News blog. Worth a read – and if you can, contribute to the project.